During the spring and summer, you heavily depend on your mower for a great trimmed lawn and in precisely why lawn mower maintenance tips are in order. The nursery is no different as we depend to tractors – large and small, bobcats, frontend loaders and a host of other engine run “tools” all requiring routine maintenance. As with any other engine run machinery it takes maintenance to keep it running right. 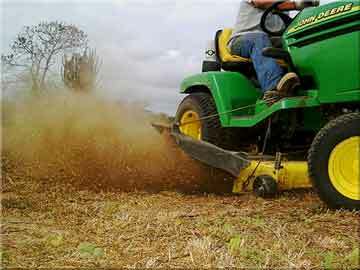 If the parts of a lawn mower are not properly maintained, it cannot be productive. The mower’s productivity starts with filters. If the filters get clogged with dirt, the right amount of air cannot get to the carburetor, which controls the air to fuel ratio that helps run the engine. The filters can usually just be removed and cleaned and put back in. It is a good idea to check the filter every time you mow. You may find you have to replace it from time to time. Oil is equally important to a mower engine. The engine will burn up without oil. Check the oil every time you mow and change the oil at least once a year. It is a good idea to change the oil after the mower has sat all winter. Also after it setting all winter the gas probably needs to be changed out too. Keep your mower clean between uses. This helps the mower function better. Remove stuck on grass and dirt. Spray it off as you would your car but remember to clean the blade and maybe apply some WD 40 to it. Check the lawn mower blade often. It does need to be sharpened every so often by a professional. Unless you know how to sharpen these blades correctly, do not try to do this step at home. You will get a much better edge with a professional. If it is a riding mower, it is twice as important to do maintenance on it. The riding mowers have to pull more and work harder. It may even need a lube job on the engine. You definitely do not want to let a riding mower get in bad shape. It could be dangerous to operate. Keep the tire in good shape and inflated with proper air amount when applicable. This allows for correct traction. If this is a pull cord type start engine, you need to watch the pull cord for wear. Replace it when it starts to look worn. 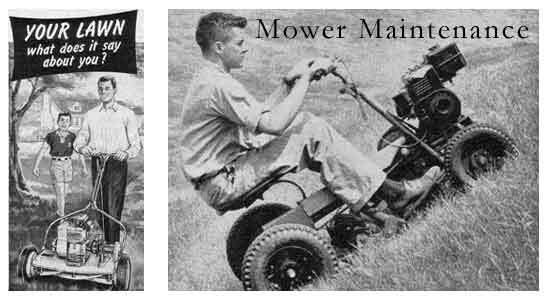 If you are not handy mechanically, you can take your mower to a lawnmower repair shop. For about $75, you can get your lawnmower thoroughly checked out. Then you can leave it if any repairs need to be done. Some people may have this done before they store it for the winter. But to me it is smarter to do it in the early spring before you have to start using it. That way you insure it working all season. A lawnmower in good shape cuts and grooms your lawn much nicer and neater the one in bad shape. You have spent so much time getting your lawn just right it would be a pity to spoil it with a bad cut due to an out of shape lawnmower.